Panasonic Australia set to release LUMIX DMC-TZ110, DMC-TZ80 cameras and LEICA 100-400mm telephoto zoom lens. Panasonic Australia is set to make three exciting new additions to its LUMIX lineup – launching the class-leading DMC-TZ110 premium compact travel camera with 1-inch MOS sensor; the versatile DMC-TZ80 with 30x zoom LEICA lens; and the first super telephoto lens in the LUMIX G system, the LEICA DG VARIO-ELMAR 100-400mm F4.0-6.3 ASPH./POWER O.I.S. The new models will be available in March from selected photographic specialists and consumer electronics retailers. The DMC-TZ110’s outstanding suite of features see this model set to be the best in class compact travel camera available. At the heart of its performance is the large 1-inch MOS sensor that captures more light, resulting in crisp, clear and natural shots; plus a versatile 10x zoom F2.8-5.9 LEICA DC lens for true-to-life images from landscapes and sunsets to elusive wildlife. This highly pocketable camera also includes Panasonic’s powerful 4K video and 4K Photo capabilities to capture every moment in impressive clarity; and introduces Post Focus to the travel zoom range, which allows users to select their preferred ‘in-focus’ area after taking their shot. The lightweight DMC-TZ80 packs a 30x zoom LEICA lens into its 300g chassis, letting you get close to the action without disturbing the subject, so you’ll never be out of range for that perfect holiday shot – equally suited to both wildlife or candid shots of friends and family. The 18M MOS sensor and 4K capabilities ensure natural results in stunning detail for every special or fleeting moment. The LEICA DG VARIO-ELMAR 100-400mm F4.0-6.3 ASPH is a compelling addition to the LUMIX G range of powerful and compact interchangeable lenses. This telephoto lens offers outstanding performance with incredibly fast Depth from Defocus, and Power O.I.S that works with Panasonic’s Dual I.S system. It is weather sealed, making it highly durable for long days in the field, and is significantly smaller, lighter and more cost effective than comparable SLR lenses. The new DMC-TZ110 is a premium compact travel camera that boasts performance typically associated with expensive interchangeable lens models. Despite the camera’s small size, the latest addition to the LUMIX TZ range combines a host of features to make it the perfect travel companion for even the most demanding photographers and videographers. A large 1-inch MOS sensor combines with Panasonic’s Venus Engine to capture consistently bright and beautiful images. The 1-inch sensor’s large pixels are capable of capturing more light, even when photographing at high ISO. Whether taking pictures on a sunny beach or during a candlelit dinner for two, the camera’s exceptional low light performance ensures crisp, clear and natural results with minimal noise. The LUMIX DMC-TZ110 is the first in its series to incorporate a F2.8-5.9 LEICA DC lens, which allows you to achieve crystal-clear images with amazing detail. The lens also features a versatile 10x zoom range of 25mm-250mm (35mm camera equivalent), making it ideal for photographing all your adventures, wherever your travels take you. The LUMIX DMC-TZ80 incorporates an 18M high sensitivity MOS sensor, allowing you to capture even the finest details of your travels. The DMC-TZ80’s outstanding optical capability is underpinned by a high-end LEICA lens with 30x zoom (24-720mm), offering versatility from high zoom to close-up shots. The camera’s powerful performance far outweighs its compact body. 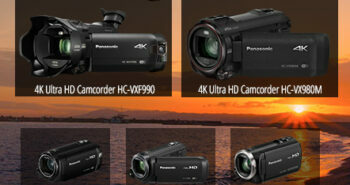 Both DMC-TZ110 and DMC-TZ80 models stand out from the pack with Panasonic’s suite of 4K capabilities. They offer 4K video recording that fits in your pocket, with four times the resolution of Full HD to bring the sights and sounds of your travels to life. Panasonic’s 4K Photo mode incorporates 4K Pre-burst mode which shoots 30 frames per second before and after the shutter is released, to capture the decisive moment with total precision. Even fleeting events such as the exact moment you hit the water diving into the sea, can be captured and enjoyed for a lifetime. Another new addition to the LUMIX TZ range is Post Focus mode which, once set, allows you to choose the focal point of an image, after it’s been taken. Post Focus uses the LUMIX autofocus capabilities to calculate the distance between the camera and the subject, capturing optimal focus for 49 individual areas within each frame. Once the photo is taken, you can then use the touchscreen to select the exact area you want to focus on – from the minutiae of your subject’s eye, to an individual bird as a flock takes flight. What’s more, from a single photo you can export multiple shots with different focal points. Once you’ve captured an array of beautiful photos and video, these LUMIX cameras make it fast and simple to share them with friends and family. Using Wi-Fi and the Panasonic Image App, it is easy to connect to a smartphone or tablet, allowing you to post to social media almost as soon as images have been recorded. Panasonic Launches LEICA DG VARIO-ELMAR 100-400mm F4.0-6.3 ASPH. Telephoto-Zoom (H-RS100400) with Power Optical Image Stabilization (O.I.S.). Panasonic’s new telephoto lens for its LUMIX G range of Micro Four Thirds System cameras combines 200-800mm zoom (35mm equivalent) and 4K video compatibility in a highly durable, compact and lightweight body. The latest addition to Panasonic’s range of interchangeable lenses is perfectly suited for photographing wildlife in all types of environments, or subjects such as sports. Elegantly designed with a metallic black finish, the new lens provides superb image rendering across the entire zoom range. The lens’ 200-800mm focal length (35mm equivalent) and 0.5x magnification capability provide highly detailed shots from a distance, as well as stunning close ups. In order to capture steady, vibration free images across the entire zoom range, the lens also incorporates Power O.I.S. to keep unwanted shaking under control and ensure that pictures look crisp and clear. When used with a LUMIX DMC-GX8 camera, the user can benefit from Panasonic’s class-leading Dual IS stabilisation technology. The 100mm-400mm lens is also suited to a variety of photographic styles – with nine diaphragm blades providing a circular aperture to produce a smooth and beautiful bokeh. The LEICA lens is constructed of 20 elements in 13 groups and incorporates a number of aspherical and extra low dispersion elements to ensure high quality and avoid flaring. When compared with conventional super telephoto DSLR lenses, the latest addition to the LUMIX G line up offers outstanding mobility – perfect if you’re travelling and don’t want to pack too much. Similarly, the lens also boasts a durable, gapless construction so you no longer have to worry about unwanted dust or light rain damaging your equipment. In addition to the lens’ practical size and weight, a compact, two-part tripod mount has also been incorporated to enable faster conversion between landscape and portrait orientation. While conveniently and speedily turning to the 90 degree angle, the levers for Focus Limiting, Power O.I.S. and the manual focus switch remain right at your fingertips as they do not move when you turn the lens. The lens incorporates an integrated, hideaway hood to help you capture that perfect shot, without having to worry about sun glare, and is also supplied with a larger detachable lens hood. Panasonic’s new LEICA telephoto-zoom lens is perfectly suited for 4K video recording with its construction ensuring outstanding contrast and colors. Furthermore, the telephoto-zoom incorporates Panasonic’s high speed and precise 240 fps AF-motor. The design allows filming to be conducted silently, so you can get up close to the subject without drawing attention. As well as high resolution video, the lens’ 4K capability also enables you to take photos like never before. 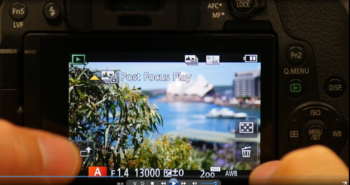 Panasonic’s 4K Photo function – found on LUMIX G cameras including the LUMIX DMC-G7 – lets you extract an 8-megapixel still from 4K video (30fps) easily right on the camera’s screen with a simple fingertip touch.